Here is an infuriating New York City scenario. You are driving a car or in a taxi on an avenue and need to change direction by turning onto a crosstown street. Now in most situations, you have many choices as to which crosstown street - most of Manhattan is a grid. There are 20 crosstown blocks to a mile, so for most trips you there are dozens of streets you could take. If you are really knowledgeable about traffic patterns, you can narrow your choices, but nearly always, you will still have many equally good options. Your final decision will have an element of whim. So you make a turn down a street and by pure chance you happen to select the block where a sanitation truck is picking up trash. The street is not wide enough to pass and sanitation workers will never try to accommodate you in any way. And you know you will be there for quite some time, crawling behind that truck, watching as they go about their business one can at a time with no sense of urgency, because this is their job, a job that must be done. And what can you say or do? 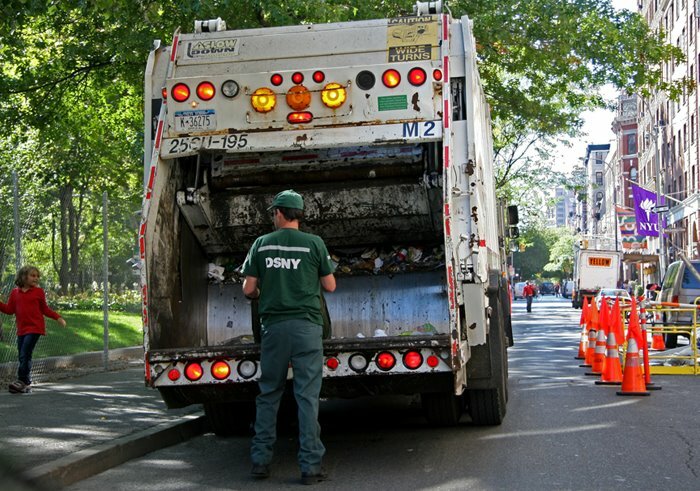 This is the New York City Department of Sanitation and you want the city kept clean, right? Now if you are a Zen master or one who can take life in stride, perhaps laugh at times like this, then you are fortunate. But if you are in a bit of a hurry or prefer not to spend your life waiting for traffic lights or behind trucks, because you have already spent too much of your life here waiting, then you may find yourself stewing a bit. There are better things to do. As time passes behind that truck, time that passes slowly (it will be a long time to go down that whole street stopping at every building) you can easily imagine having chosen another street. Any other street. You can play out all the scenarios and reflect on the odds that of all the streets in New York, you chose this one. No backing up either, because in this city, it is rare that cars are not immediately behind you. Photo note: This photo was taken going south on Washington Square West in the morning - not the classic avenue/crosstown street scenario. There were few trash pickups to be made, little traffic and some opportunities to pass around the truck. So this was only reminiscent of the real deal, not an authentic ulcer maker.